What do all men love? Meat, women and beer. It’s no coincidence that the Bavarian Oktoberfest, which celebrates all of the above, is a huge event every year. And I am personally very happy that we in Amsterdam are joining in more every year. 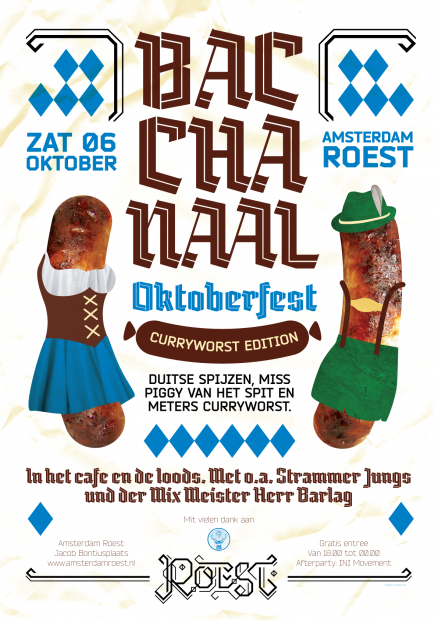 My pick for 2012 is Roest’s Bacchanaal. They promise long tables with checkered tablecloths, beer mugs, girls in dirndls, pig on spit, schlager music, pretzels and curryworst by chef Jaymz. I’m already getting hungry and thirsty writing this.